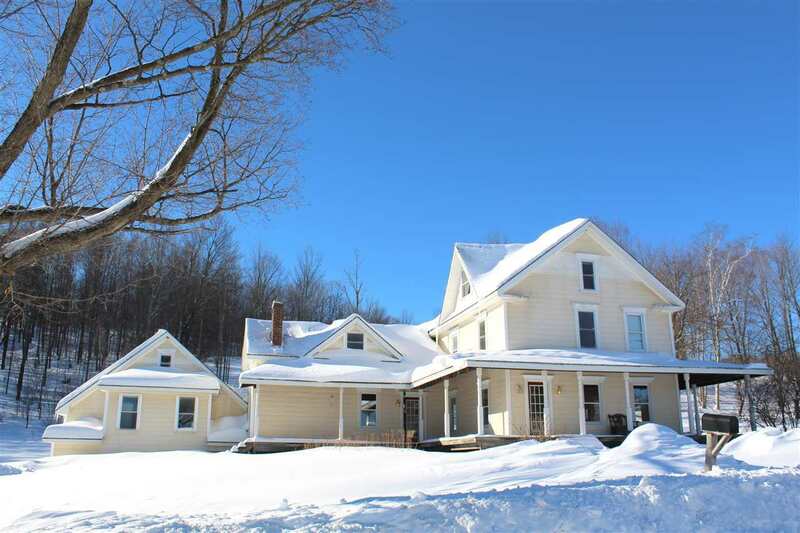 Large farmhouse nestled on a country road with 10.1 acres. From the stone walls, to the mature landscaping to the beautiful panoramic mountain views this property is the perfect home for your growing family! Enter onto the large wraparound covered porch into the foyer. Open living/dining area with 9' ceilings, full of natural sunlight and architectural details. The cherry kitchen with breakfast nook offers an island, pantry, appliance garage, faux antique stove, built-in desk and access to seasonal mudroom. 9' ceilings and hardwood floors with in-lay throughout. 2nd floor includes 3 bedrooms, a full bath and a French door leading to the 3rd story, ideal for a bedroom with private bath or rec area. Full basement, attached garage and an in-law suite which includes a small kitchenette, living space, sleeping quarters, full bathroom and mudroom. All only 10 minutes to I-89!